Regional dip, often called structural dip, is chosen in zones where dip angle and direction are consistent, with a minimum of scatter. These are GREEN patterns. Due to the roughness of the borehole, and statistical variations in the correlation measurements, even a zone with zero dip will show some scatter. In particular, dip direction may appear to fluctuate wildly when dip is near zero. Regional dip may not be easy to find. In thick sandstones, there may be too many stratigraphic features, and in thick carbonates there may be no bedding or too many fractures. Therefore, shale sections should be preferred for the selection of structural dip. If there is not much shale, choose the minimum consistent dips in the sands. However, shale sections do not always exhibit a regular dip. The mode of deposition as well as post-depositional slumping or fracturing may induce erratic dips. Bad or rough hole will also cause dips in shale beds to be scattered. A statistical approach may then be needed to determine structural dip, and local experience is the best guide. Here is a case for using the modified Schmidt plot or the frequency azimuth plot to help find regional dip. It is essential to subtract the structural dip (by means of dip vector rotation), preferably by having a regional dip removed arrow plot created in the computer. Indeed, a blue pattern may become a red one and vice versa after subtraction of the general trend. The term "absolute red" and "absolute blue" are used to describe patterns which are distorted by regional dip. If, after drawing the patterns, you find regional dip to be greater than about 4 degrees in any zone, you should have the log re-displayed with dip removed. Obviously a different amount of dip will have to be removed from different geologic sections. Pick these values for each section from your green patterns between each major break defined by the black patterns. 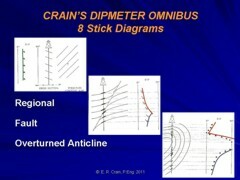 The illustration at the right shows three dipmeter presentations of the same structure. Each has a different regional dip superimposed on the red pattern, which is only visible in one of the illustrations. This emphasizes the absolute necessity of working with dip removed data. You will have to re-analyze the dip removed log for red and blue patterns. You will use these ONLY to identify the nature of the structural features and the direction to thicker pay zones. 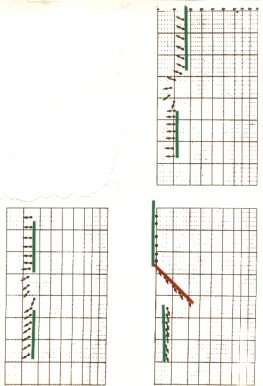 The true dip and direction of beds is still contained on the original log, and it is still used for mapping structures and looking for the next drilling location. A dipmeter log should always be correlated with the rest of the open hole logs when the patterns are being drawn. A computed lithology log is especially helpful to prevent drawing silly patterns which cannot be supported by the obvious lithology. For instance, it would make little sense to unite in the same blue pattern two arrows belonging to different lithological units. A good well history and the formation tops should also be at hand, since most major unconformities will occur at one of these points. Some of the modern dipmeter presentations, such as SYNDIP, GEODIP. and STRATIM will make life much easier. However, they are only available on modern logs, and even then, may not have been run (to save money), or may not be in the well file or in the public domain. These logs are aids, not answers - be sure the aid is properly processed and makes sense in light of other known data. On older wells, you will have to create your own equivalent aids by laying out and possibly analyzing the other open hole logs. The minimum requirement is a gamma ray or SP log at the same depth scale as the dipmeter arrow plot.